Thanks to its clever combination of bowl and lid, clamshell packaging is a particularly versatile form of packaging. For the production of clamshell packaging we have a machine that is just as versatile. Thanks to the high precision of our technology, you can produce your clamshell packaging in just the form you wish. Our thermoformers reach an extremely even spread of plastic over the entire clamshell packaging. You will easily produce clamshell packaging with a tight lid using our machines. Cast steel at the forming station ensures that our machines are particularly stable and solid. Our machines achieve the output volume desired depending on each model. No matter whether the large-scale series production of clamshell packaging, the manufacture of special clamshell packaging in smaller series or the production of a wide range of clamshell packaging – our machines offer you all the options. Our FOCUS machine series is designed to specifically meet the demands of production in multi-station operation. With the standard size FOCUS 80, the smaller FOCUS 60 and the large FOCUS 100, the series has the suitable solution for clamshell packaging. 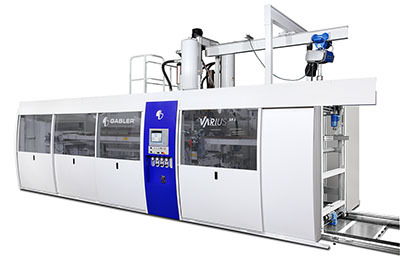 VARIUS F is a solely forming machine. As the entire tool area is used for forming, VARIUS F produces with a particularly high output. In combination with the separate cutter Cut960, it results in an excellent production solution for clamshell production. In our range, we have the right additional components for clamshell production: for crimping cups, for pre-heating PP foils, for cooling tools, for separate punching, for granulating punching cut-offs or the automatic roll changer.